Whilst diamonds are the hardest natural substance, this doesn’t mean you don’t need to take care of them every once in a while. Follow these steps and your diamonds will sparkle forevermore! One thing we love about diamonds is the sparkle they give off. Diamonds are simply stunning. They have an undeniable charm that is will always be elegant and timeless. If you love your diamonds it’s important to take care of them. But you might not know how to do this. All you need is a very soft baby’s toothbrush, some soap and water – with emphasis on the ‘soft’! Over time claws may wear causing the diamond to be less secure. So make sure you are as gentle as possible with your jewels. The bristles on a baby’s toothbrush are fine and soft. This enables it to wriggle its way inside the setting and into the smaller, more intricate parts of the ring. It’s the perfect tool to remove any dirt and unwanted grime. After that, splash a bit of water over it and your ring should instantly sparkle, just like when you first got it. Is there still some dirt stubbornly lodged inside the ring? Bring it into any one of our stores. Our ultra-sonic cleaning machines will be able to shift these using micro-vibrations. After a while you might start thinking “my ring looks dull and tired”. 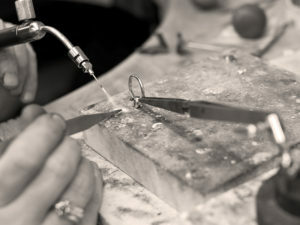 This is when you should come to us and let the experts give your ring some TLC. Just like you would get your car serviced or a check-up at the doctors, your diamonds too need regular maintenance! For this, we recommend a Clean, Check and Polish service (CCP) every 12-18 months. This means your diamond is checked for security and the claws are tightened if required. 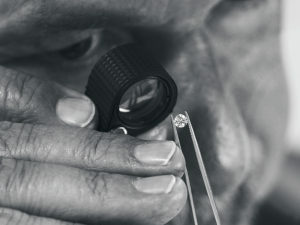 A full clean of the setting and diamond, and also a polish of the metal is carried out. Any possible damage or issues are also highlighted at this stage. It is a good way to keep your diamond in good condition and sparkling, plus the metal will look shiny and new. Your diamond ring should be the last thing you put on before leaving your home. And the first thing you take off when you get back home. Due to the chemicals in cleaning products never wear your diamond ring when doing house work. Always take your ring off before applying hand lotion or any other ointment and creams to avoid leaving a film over the gem. If your diamond ring has had a knock then take it into any one of our stores. Our experts will take a closer look for any damage. Don’t assume that because diamonds are strong, they are indestructible. Apply a little common sense when it comes to your diamond jewellery. Be careful, regularly clean and check you ring and it should stay sparkling for a lifetime. 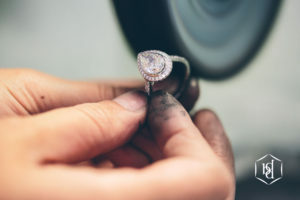 Thank you for taking the time to read our guide on how to look after your diamonds and the SERVICES that Laings can offer! Follow our latest news on Twitter, Facebook, Instagram, YouTube and Pinterest, or if you have any questions please pop us an email at info@laingsuk.com.